Just want to share this 5 mins expiry strategy here. It is an extension from another thread. Please refer to this link where it all began. Not much difference, fundamentally. 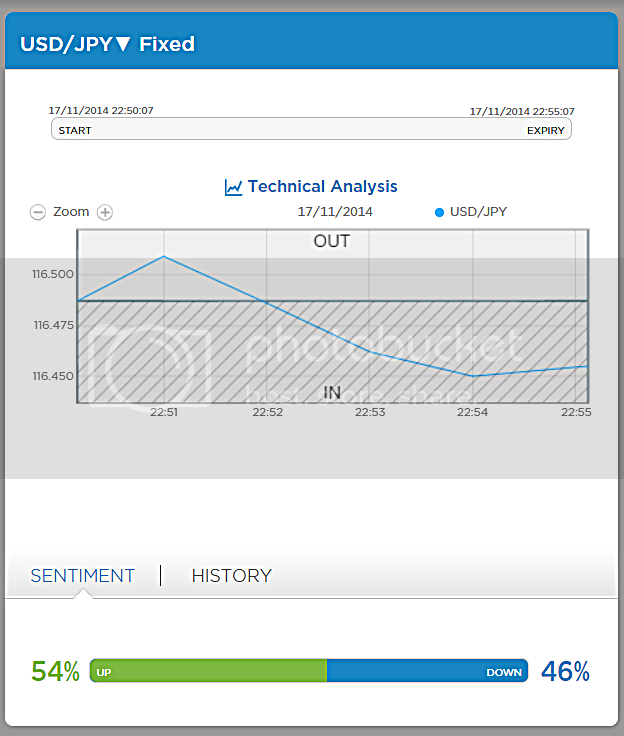 we are still making entry base on market's momentary overbought and oversold conditions. Be it a momentary pull back during a trend or a full reversal, this strategy can assist in your decision for making entries under such conditions. This strategy does not belongs to me but rather it is a combination of several strategies found over at BOD and here as well. In essence we are all trading for pullbacks, reversal and bounce, this strategy is just one of the many and it was result of a mashup of several threads. Lastly, this strategy is not a crystal ball. It only gives u a stream of information to assist u in your entry decision up to that moment before u make the entry. So let's be realistic. A strategy is as good as the strategist. i would like to give thanks to Bryan Mac, Holy Fire, Ronmark and Tradesmart for their selfless contribution to this strategy unknowingly. Up to this point in time. This are the few things u will need to start using this strategy. This is the complete list to start up this strategy. Make sure your BB setting is this. Which i believe is the default settings. This is the crux of this strategy. This is how your setup looks like. Once u have this setup, we can proceed with the Rules for Entry. 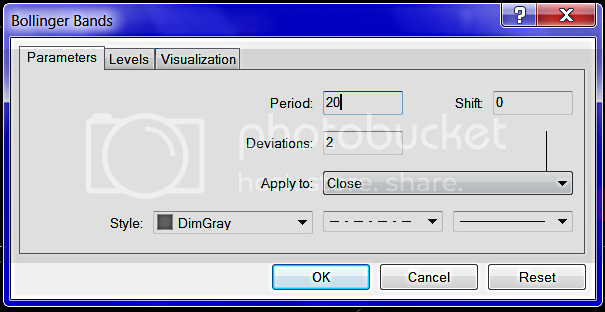 This setup can be used by traders of all levels. Dont be overwhelm by the sight. i will go through it and u will see the systematic and methodical way of processing all these info in a jiffy. Primarily, we are trading momentary bounce, pull back or full reversal. We are making educated guess that the next 5 min candle is going to go against the current candle. Alert being the current candle while Entry being the next 5 min candle. This setup is essentially what we are seeking. This scenario being the CALL. And this setup is for PUT scenario. Now, this is the Cardinal Rule that these 2 scenario setups has in common and is VITAL. 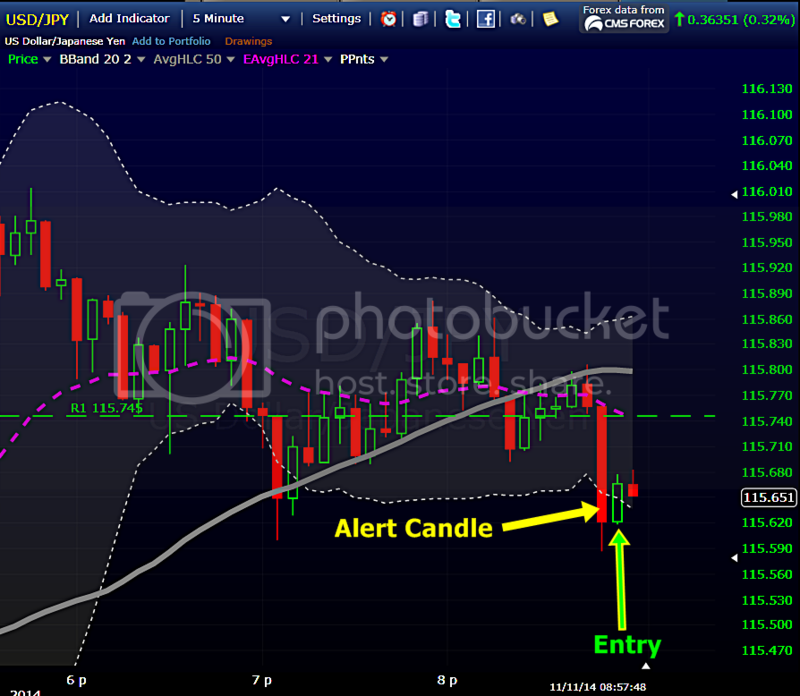 Both the ALERT candles, CLOSED outside of the BB. Specifically, they both OPENED while inside the BB and CLOSED outside and CLEARED of the BB. The BB lines has to be completely 100% cleared from the closed candle. That is the closed end of the candle has to be away and cleared from the BB lines. And not touching the BB lines. Proximity is not a concern here but the CARDINAL Rule is the edge of the closed candle has to be cleared from the BB lines, that is all. 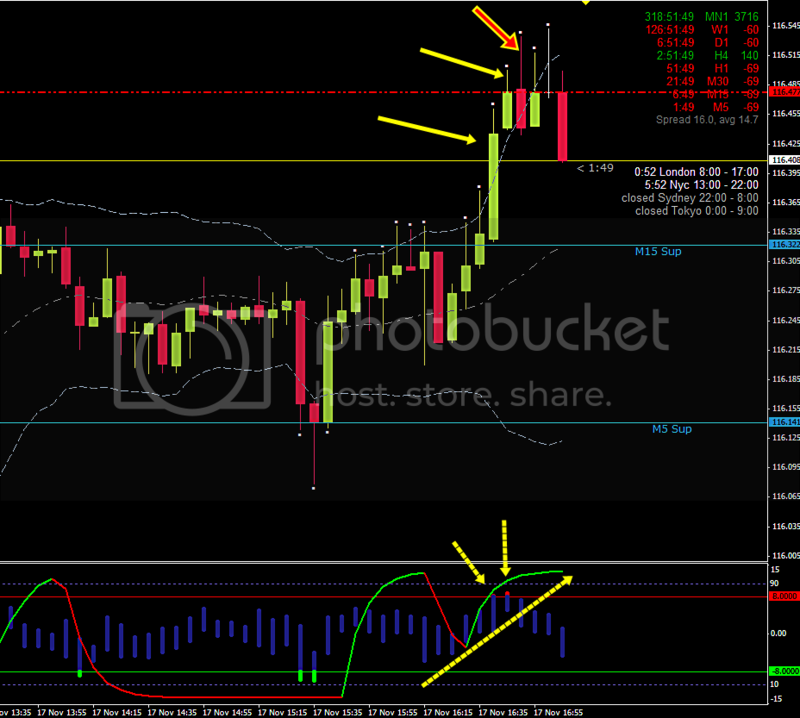 Hi Hubba, thanks for all your input, any chance of getting the indicators for Pro Fx CTrader? The following posts to come, i will list out the HARD and SOFT rules for this strategy, to the best of my knowledge and capacity. This strategy is able to be use in all market conditions. Dont take my word for it, try it, demo it. But lets be clear here. Strategy or System alone does not give u winners. Market gives u winners when u are properly equipped and prepared. This strategy will assist u in the equipped department. The following HARD and SOFT rules will hopefully make u prepared, more or less. There is no bad strategy only bad strategist. the entry is only when the level touches the key and not touching BB line? hi Alanmia, i am sorry. i am not sure exactly what Pro Fx CTrader is. I actually dont know anything about indicators. all i did was mashup all these free indicators and give it a go. Hi Christianf. hang on for a while. i will post the steps taken to make an entry. i will also let u know which rules MUST follow and which rules u can bend it to suit your risk appetite and style for trading. 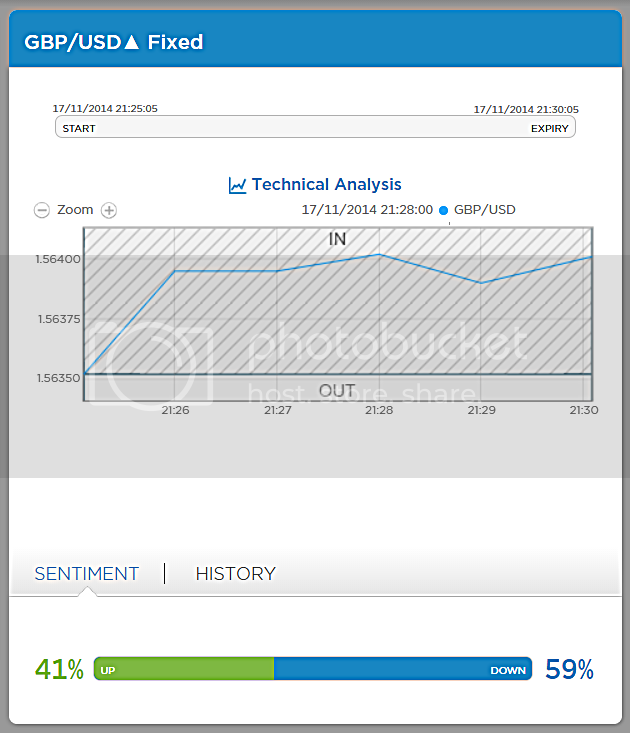 Also why do u use the BB from freestockcharts? I found that if the candle with the signal is smaller than the previous candle it wins in 2 candles but sometimes 3. And if the candle with the signal is larger than previous candle it wins with one candle but not always. This is a trade i made and won 30 mins ago. i will use this chart setup for a simple illustration on the backbone of this strategy. As i mentioned earlier, the CARDINAL RULE, is to have the alert candle closed outside of the BB, before any entry can be made. 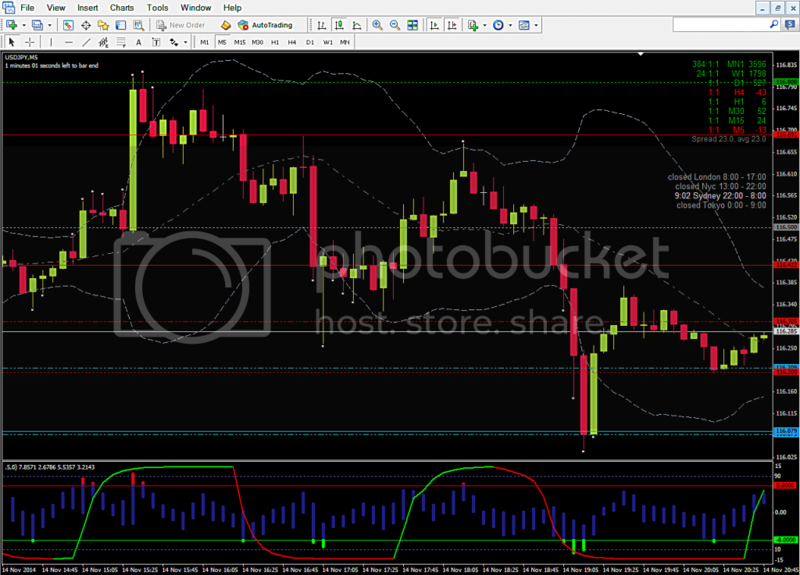 The indicators that i used, does not require u to be seated throughout your trading session. 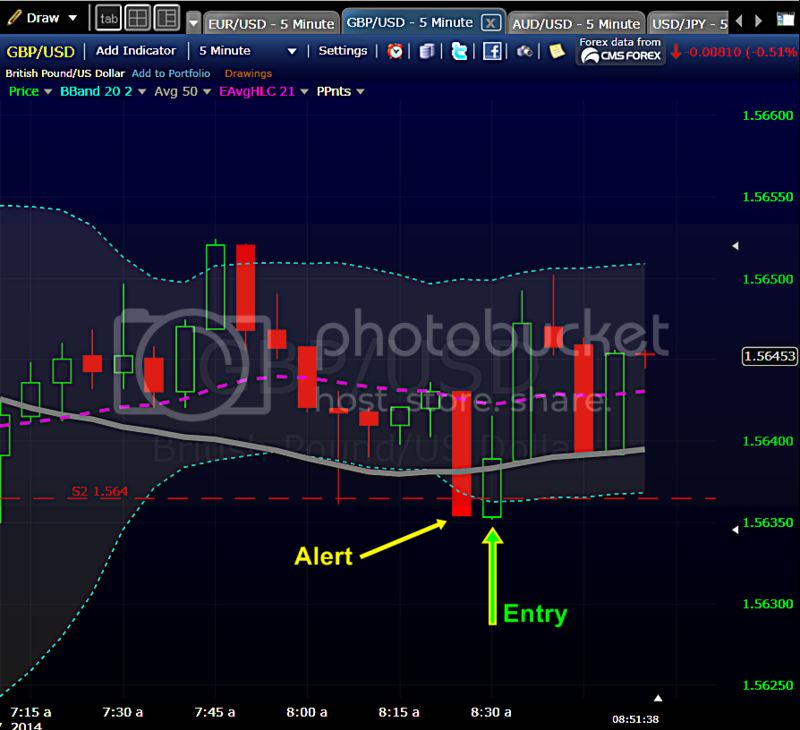 There are 2 important indicators alerts that make things much easier. BolliToucher and VCustom3. Now for a candle to fulfill our CARDINAL RULE and be eligible for an entry, the candle must of course venture out of the BB. And since we are trading for momentary pull backs, full reversal and bounce, we must ensure the pairs are in OB/OS. As long as a candle venture out of the BB within the time frame of the candle (in this case 5 mins), BolliToucher will sound off. I will only scan pairs for probable setups when this alert sounds off. Then the job of the VCustom3 is to sound off OB/OS conditions. So in a perfect scenario, the BolliToucher sound off followed by VCustom3 , then its time to sit up and get your checklist for entry ready. For those who are using this strategy for the first time, i would suggest the moment the BolliToucher sounds off, start scanning for probable setups. I will explain further how to further strengthen your odds of winning for every entry. For example if u refer to the chart above, the position where the alert candle closed, it meets the CARDINAL RULE plus, it rested on S1 and it was tested and bounced off earlier. 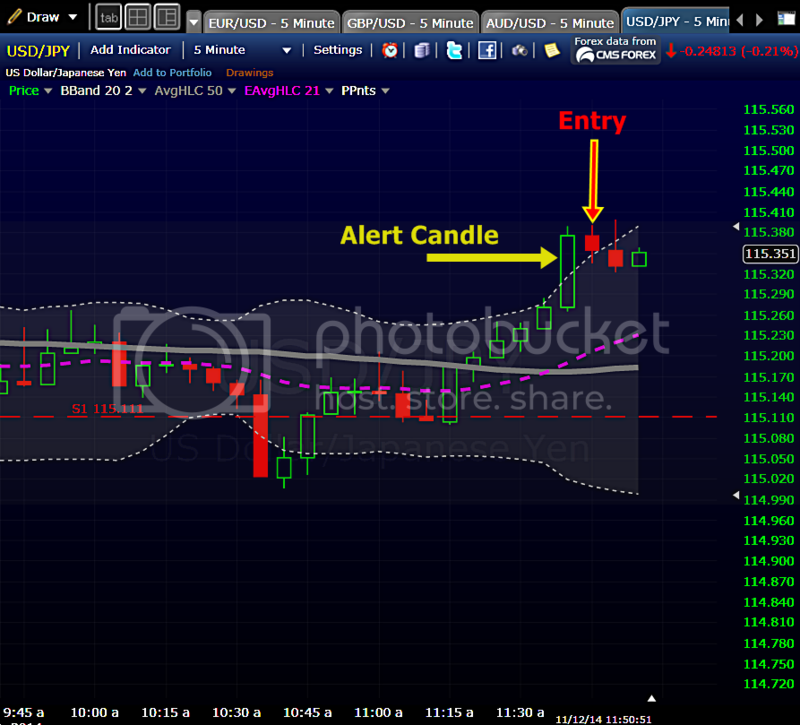 These are few of the things we need to strengthen all our alert candle before deciding any entry. I will elaborate more in the posts to come. It will include HARD and SOFT rules. Also i will give a summary of steps, how does it look like to trade this system using the 5min expiry strategy. another winner 20 mins ago. 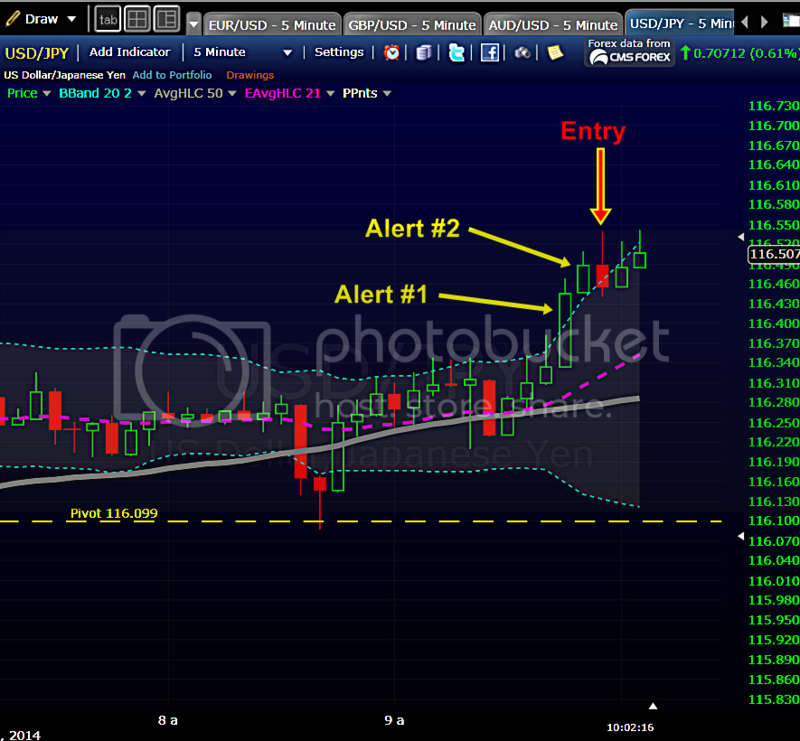 from this u can see the Alert Candle #1 already has fulfilled ALL criteria for making an entry. Meaning all the required conditions are met. OB at VC and the Cardinal Rule. But i felt that the reading of VC was strong but not strong enough. So instead of taking a chance and make an entry and lost, as show in the chart. I prefer to wait. I felt that for a bounce to occur for that size of candle, i needed more convincing. this is the exact chart setting as above but in MT4. if u look at the VC window, u will see the trend strong and the Alert #1 candle can only punch just above the 8.0 mark in VC. I believe there is more momentum to it. So i waited for another candle to open. And once the second candle opened it punched higher than the first candle in the VC window. Punching in at 8.8 mark. Notice the length of the candle in VC window, it is short. Also STC just crossed over the OB setting. Now, that is an entry with strength and better odds.